When choosing an office photocopier, it is important to think about the size of paper you are going to be printing on. 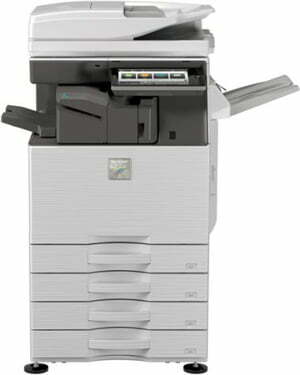 Printing on A4 paper is extremely common place in the work environment and widely accepted as the most popular paper size, but some businesses will need to have an A3 photocopier for printing off particular print jobs that require a larger size, such as posters, spreadsheets, large diagrams or marketing materials. You may be able to get more functionality from an A3 photocopier, so it is important to consider what you are wanting to print, before choosing between an A3 or A4 device. If you do decide to go down the A3 photocopier route, then the following devices should be high up the list of considerations. These are some of our most popular A3 photocopiers at the moment, from our range of photocopier brands. Designed to flourish in multipurpose environments, the new Ricoh MP C3504 photocopier offers a multitude of functionality to increase productivity. 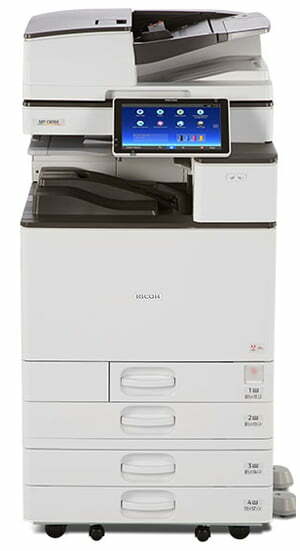 This Ricoh photocopier has a new Intel-based controller, greatly enhancing printing and scanning, whilst reducing the overall processing time. Its 10.1″ Smart Panel Screen offers a whole world of applications, designed to create a seamless user experience. Download and install apps from the Ricoh Application Site (link here) as well as apply updates and firmware. The Sharp MX-4070 is a 40 page per minute colour A3 photocopier, delivering excellent colour quality for documents that have a beautiful and professional look. This MFP from Sharp comes as standard with both PCL 6 and try Adobe PostScript 3 allowing you to print graphics at their best. 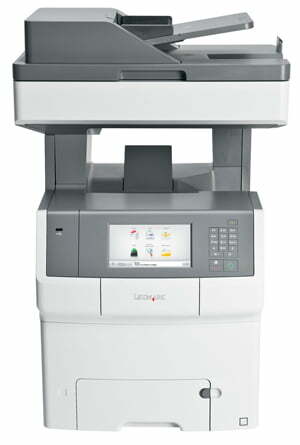 This Sharp photocopier supports up to 1,200 x 1,200 dpi printing and copying, giving ultra-clear image quality. Toshiba’s latest A3 colour photocopiers, combine impressive features with fast speeds of 45ppm. The tablet style user interface not only makes the photocopier easy to use, but it can also be customised according to overall business, or individual requirements. 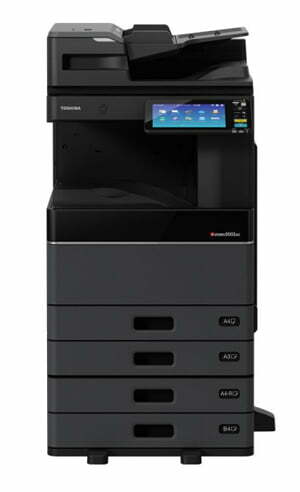 The Toshiba 4505ac can handle a large range of paper weights and sizes, ideal for schools, copy shops and marketing teams. Paper up to 280g/m² in weight and 320×460mm in size can be printed. Banner paper up to 1,200mm, waterproof paper and envelopes can also be printed, making it an extremely desirable and versatile choice. The robust Lexmark XS748de is a high quality, colour, all-in-one photocopier from Lexmark, and is a firm favourite with offices and workplaces up and down the country. One of our most popular desktop photocopiers, it offers all the functionality, speed and finishing options you need to run a busy, productive office. Excellent image quality and professional colour matching makes the Lexmark XS748de a favourite for departments wanting to print high-impact, colour documents. Quick and efficient, this colour all-in-one is a great asset to any office or workplace. With all the latest features and apps available from Lexmark you can tailor your solution for each individual or workgroup, depending on their print, copy, scan, fax requirements. 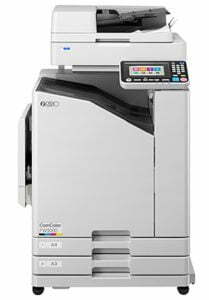 The ideal choice for fast, full colour, high volume, low cost printing, the new RISO ComColor FW5000 provides 90ppm colour printing, with just a 5 second warm up time, meaning both short and long print runs are incredibly efficient. The easy to use interface on the new RISO ComColor FW range makes it easy for anyone to use the touchscreen panel, while the compact design means it can fit in the smallest of spaces. The FW5000 is 33% smaller than the previous ComColor range, yet there is no compromise on speed or quality, bringing advanced features as well.